Initially abbandoned 2005 collaboration between John Foxx and ex-Japan percussionist, Steve Jansen. A Secret Life came about through Foxx meeting Jansen, at a 2005 performance with instrumentalist, Harold Budd. Jansen recorded tam-tams (gongs) for a possible collaboration album with Foxx, but these recordings were eventually shelved due to both artists' other commitments. 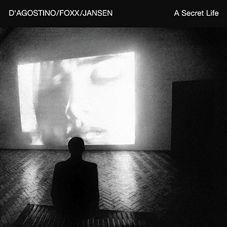 The final release of A Secret Life is down to regular Foxx live bandmember, Steve D'Agostino, who took it on to complete the work and present it in all its abstract glory. A Secret Life begins with a variety of sparkling, shimmering sounds and warm tones. The majority of the sounds are made up from Jansen's tam-tams and resonating percussion sounds, often slowed right down into one long metallic drone. It's a strange recording that will take you by surprise from one moment to another - a part made of grating echoes will suddenly change into something much warmer and melodic as Foxx's emotive piano drifts in and out. The second part eventually achieves the right balance between the experimental atmospheres and the piano lead, which continues into part three. Several points throughout the course of A Secret Life hint at a direction it sadly never takes, and it soon lacks consistency and continuity, eventually sounding closer to Tangerine Dream at their most experimental; sparse, droning, humming, pulsating and resonating icy chills, often irritating after a while. A Secret Life works remarkably well when listened to on headphones, as it is a very sonic album - slightly reminiscent of Cliff Martinez's soundtrack to Solaris in places. While a lot of it sounds like a recording of somebody crashing around a shop full of wind chimes or a dozen clanging frying pans struggling to fit back into the pantry, it has some genuinely lovely bits - mostly the piano, which adds a much needed element of melody. Sadly these brief moments of beauty don't lead to anything more continuous or engaging. The piano parts are very similar to those of Translucence, but with more going on in the background, which does give a little more variety. A Secret Life was an unfinished project for a while, and on first impressions, it still sounds that way. It is only slightly comparable to Foxx's work with Harold Budd, sounding more like an experimental film score than conventional album, or more something to play alongside an exhibit in an art gallery. Overall, A Secret Life is very sparse and occasionally difficult to digest. Anybody who prefers their instrumental music with more melody and substance, may not find satisfaction here. Cathedral Oceans or Tiny Colour Movies it certainly is not - A Secret Life is clearly the most unusual album in Foxx's back catalogue, offering a bizarre and often unsettling soundscape in which to escape.